On a sunny Sunday afternoon hubby and I enjoyed a fairly long walk along part of the Cumbrian Coastal Path/Coast to Coast walk on what is known as the Colourful Coast. Descending into Fleswick Bay I stopped to take some photos for #wildflowerhour on Twitter. Hubby noticed a pool of water with tadpoles swimming in it (in August!) and nearby was a colourful item, which was a potential hazard to livestock and wildlife. I hadn’t thought to take a bag for collecting litter, but I realised that the synthetic ribbons (unlikely to be biodegradable) could be attached to the outside of my small backpack, leaving my hands free for photography. Balloon releases are popular in this area to mark happy and sad occasions. Partly because some balloons are marketed as biodegradable many people are unaware of the hazards they pose to creatures. 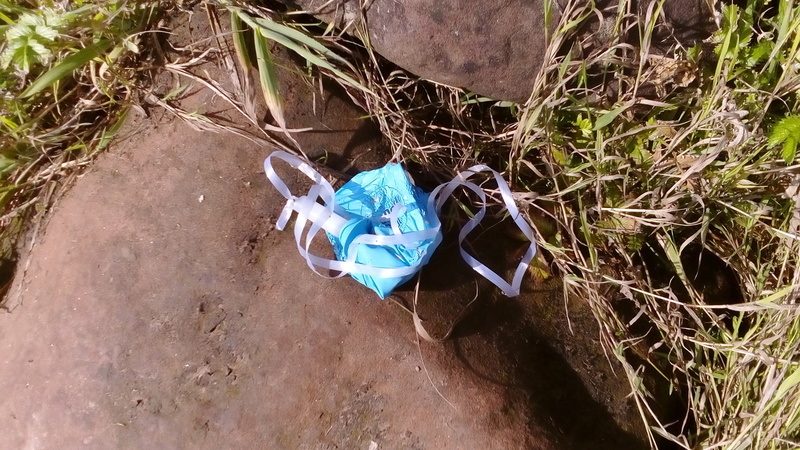 It is possible that the balloon we found was biodegradable. It had become sticky. Hubby used the tip of a walking pole to detach it from the sandstone rock it was on. The white plastic and the ribbons would have taken an indefinite time to decompose. There is no saying where they might have ended up. Probably it would have been in the sea as the path becomes a stream after heavy rain. The flowing water might have washed the plastic into the bay. A high tide could have taken it out to sea. I put it in a bin at St Bees beach. It will end up in landfill, where it remains a potential hazard, although it will be buried. How long is it going to take before balloons are consigned to history like celluloid dolls? Near to where the balloon was found cattle were grazing in a field. The nearby beach is a secluded beauty spot. The coast is managed by the National Trust and Cumbria County Council. A number of improvements have been made since the last time we walked so far along the path, which is popular with local people and visitors. An earlier walk is described here. Here are some more attractive photos. The final one has more evidence of the thoughtlessness of people. Please respect the countryside. Take your litter home and take care not to start fires. And please, please, PLEASE do not release balloons or lanterns!